Plate thirty seven from 'Picturesque Scenery in the Kingdom of Mysore' by James Hunter (d.1792). This aquatint is based on a picture by Hunter depicting a Royal Artillery encampment. 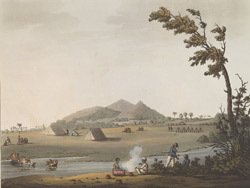 Hunter was a member of the Royal Artillery and many of his picture depict scenes from military life in India during the late Eighteenth Century.